White is white, right? Wrong. When it comes to buying LED Christmas lights, if you want white, you're going to have to clarify that decision just a bit. Because as it turns out, there's really no such thing as "just white" - at least when it comes to LED lights. In fact, there are three variations of white LEDs: warm white, pure white and cool white. That's a good thing, because it gives you a range of choices. 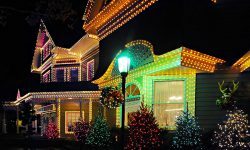 It'll help you tweak your holiday light design to more perfectly duplicate the mental image you have in mind. Just as cream white, designer white, off white, or some other variation of white paint might best match your vision when painting a room in your house "white." But that freedom of choice comes with a bit of a catch: the variations of white LED lights can vary significantly from one manufacturer to another. That's not really a problem when you're buying your first set of lights. But if you're buying some lights to supplement what you already have, and you want those new lights to match - beware. Even if you buy a variation of white that's labeled exactly the same as what you currently have, the differences may be significant. In fact, the old and new may not match at all. Warm white is the most popular shade of white LED lights. It's also the most popular color in general. 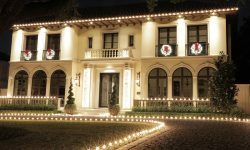 In part, at least, the popularity of warm white LEDs might be because they closely match the look of the white incandescent lights that were Christmas lighting mainstays for generations. Warm whites achieve their classic look by mixing a hint of yellow with the white. That slight yellowish hue gives the light the 'warmer' look that is so popular. But the amount of yellow that's mixed with the white varies considerably among manufacturers. The vast majority of Christmas lights are produced in China. And to date, the manufacturers have been either unwilling or unable to settle upon a standard for warm white. For that reason, you're likely to have more difficulty matching new lights to your existing lights when shopping for warm whites. And since it's a problem of inconsistency among manufacturers, the lack of color constancy effects everyone that sells Christmas lights, from the giant big-box stores to the smallest online retailer. So if you're buying some warm white lights to match what you already have on hand, your best bet is to ask for a sample. Images, whether online or in print, generally won't be accurate enough for you to tell whether the color will be close to the lights you're trying to match. The LED light industry is still fairly young, so hopefully the eventual adoption of industry-wide standards will someday eliminate the color inconsistency problem. Cool white LED lights have an identity problem: they're often mislabeled as pure white lights - even by well-established Christmas retailers who should know better. But in truth, cool whites are not a pure white color. Instead, a bit of blue is mixed with the white to create a cooler (as in less warm) look. Not so long ago, cool white LED lights were the only white LEDs available. That's because in the early days of the LED industry, other variations of white were more costly to produce. So every white light came with a bluish hue. As with warm white LEDs, cool whites are fairly inconsistent from one manufacturer to another, with each exhibiting varying degrees of blue tinting ranging from very slight to considerable. The difference is significant enough that you should probably ask for a sample if you're trying to match new to old, just as with warm whites. Pure whites are exactly what the name implies - they are pure white. No other colors are incorporated to modify or soften the color. The result is a pure white that some feel is a bit too harsh, and that others love. As with most things, it's a matter of personal taste. But in recent years we've noticed a trend: pure white LED lights are gaining in popularity. We sell more of them every year, and we anticipate that the surge in popularity will continue. 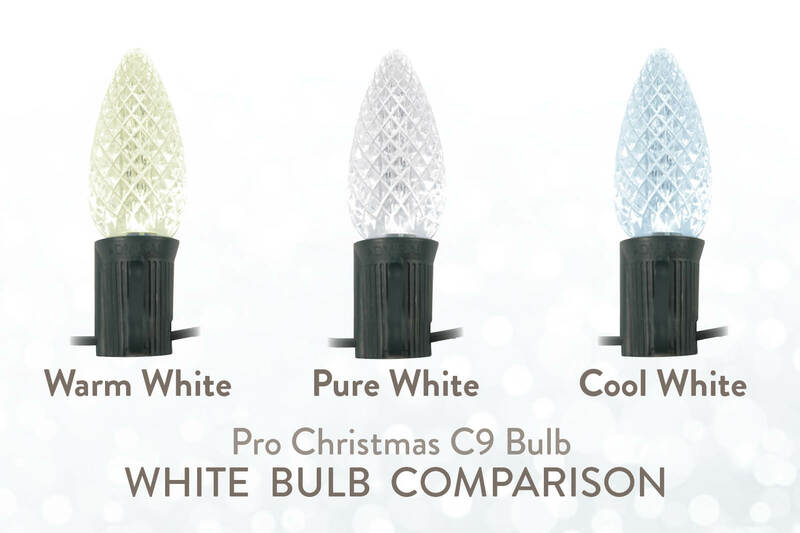 Perhaps as LED lights become more dominant as the go-to choice for Christmas lighting, the desire to match the old-style softer white of incandescents becomes less compelling. 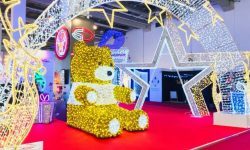 If you're shopping for some pure white LEDs to match what you already have on hand, you can breath easy, because there's not much variation from manufacturer to manufacturer. Unlike warm whites and cool whites, pure whites from different manufacturers will usually be a very close match. More Variations of White LEDs? But when you're shopping for white LED lights, you might encounter lights that aren't labeled as one of the 3 variations described above. Soft white, classic white, antique white and off-white are examples of fairly common names for supposed variations of white LEDs. 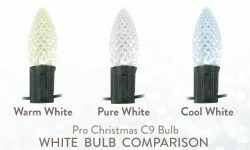 You should know that these are not unique varieties of white, but instead are usually just variations of warm white LEDs. And that simply means that they will have more or less of the yellowish hue that's used in manufacturing warm whites. With the different variations of white now available in LED lighting, you have much more choice and flexibility than in the early days. Even with incandescents, there was really only one choice of white. But the lack of standardization among manufacturers can be a bit of a headache if you're trying to match new lights to old. 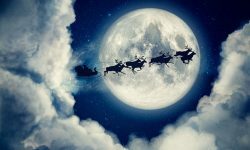 If you're purchasing from a well-established, reputable Christmas retailer, that lack of standardization will likely be less of a problem for you. Here at Christmas Designers, for example, we work hard to assure that what we're selling now closely matches what we've sold in the past. So if you bought warm, cool or pure white bulbs from us in the past, buying the same from us now will likely offer a close match. 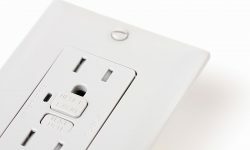 We take on the white-on-white match-up problem so that you don't have to. Let's hope, though, that the Chinese manufacturers that dominate the industry will eventually get on the same page. It would make life a bit easier for all involved!